The Magneta EIBT1 Inflatable Boat Trailer is a galvanized multi-purpose trailer that in addition to carrying inflatable boats can also be used as a pedal boat trailer or dual float boat trailer. Designed to carry boats that are 14' long (16' with optional TX2 tongue extension). 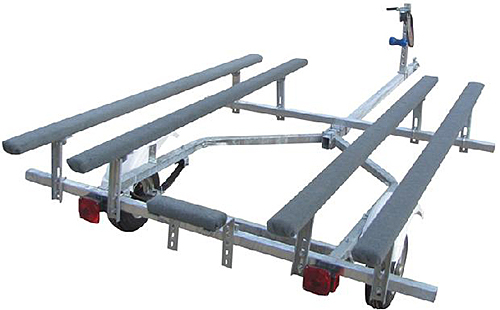 This versatile trailer comes standard with 6 foot long adjustable marine bunks, transom bunk, 2" ball coupler, and 600 LB winch. The welded heavy-duty galvanized frame is designed to provide years of reliable service. The Magneta EIBT1 inflatable boat trailer ships unassembled on a pallet by truck freight (semi).